Published on: Sun, Jun 17, 2018 at 11:34 PM | Viewed: 354 times. 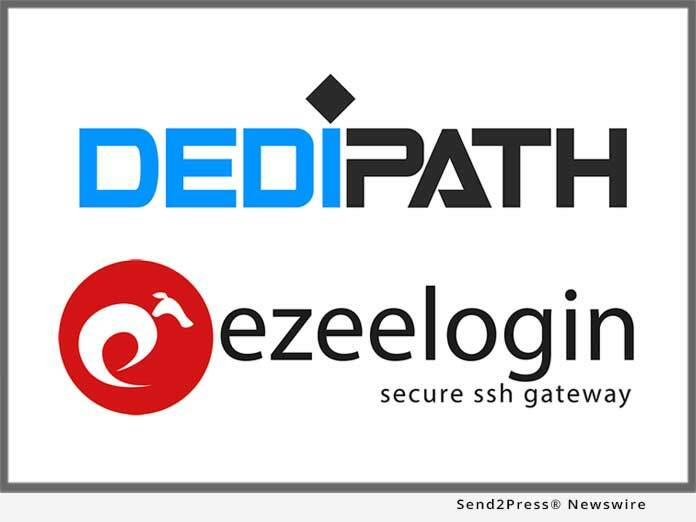 NEW YORK, N.Y., June 5, 2018 — Ezeelogin, a secure SSH Jump Server solution and centralized Linux server management software provider, today announced that it was chosen as the server software for securing internal servers in operation by DediPath, a provider of Infrastructure-as-a-Service (IaaS) that specializes in dedicated servers, virtual private servers, colocation, and managed services. DediPath is committed to providing an affordable, secure and scalable environment with 100 percent uptime across its network infrastructure. “Glad to see that DediPath is raising the bar when it comes to security and leaving no stones unturned. Helping to ramp up security for DediPath’s fleet of dedicated servers and virtual private servers, was indeed a very satisfying moment for us as it reinforces our credo of raising the security and meeting security compliance like PCI DSS without increasing the time or complexity,” said Sunjith P.S, CTO, Ezeelogin. DediPath is a provider of infrastructure as a service (IaaS) offering dedicated server hosting, virtual private servers, hybrid servers, colocation, and managed services. DediPath offers services in many major markets in the United States including Los Angeles, New York City Metro, and Las Vegas. With a collective 50+ years in IT, managed services, and colocation experience DediPath’s founders are focused on creating a strong brand that is focused on providing the best service and support at a highly competitive price. Website: https://www.dedipath.com/. Ezeelogin is a jump server solution that streamlines SSH access to Linux servers, AWS instances and cloud containers. Features include parallel shell, SSH session recording, SSH user access control, IAM, 2 factor authentications, SSH key management, and more. Our security features help enterprises and hosting providers achieve security compliance such as PCI DSS, HIPPA, ISO 27001 and more. Website: https://www.ezeelogin.com/.